Eastern DataComm announced today that it has completed the installation for Weehawken Township School District’s LENS (Lockdown & Emergency Notification System) solution. 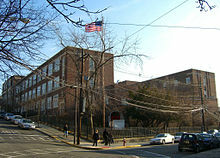 Located in Weehawken, NJ, the district, which is comprised of over 1,400 students, was seeking an emergency notification solution to improve the overall safety of their students and staff as well improve day-to-day communications. The LENS solution includes a variety of customized school safety components including strobe lights, LED sign boards, wireless outdoor speakers, desktop alerts and phone calls to 911, the local Police and school administrators. Combined with an upgraded paging system, the district can now immediately and automatically notify everyone on school grounds that an emergency has commenced. As part of the installation, the district also upgraded their 158 seat phone system to a ShoreTel communications platform. The new system, which replaced an existing Cisco system, will allow administrators and staff across the three district buildings to communicate seamlessly, add superior functionality, improve school safety and ease system management. Using the newly installed ShoreTel classroom phones, the public address, paging system and phones were easily tied together enabling them to run on one platform and maximizing the district’s investment. Eastern DataComm also recently installed a similar school safety system in Warren Hills Regional School District in Washington, NJ. Since 1988, Eastern DataComm continues to provide end-to-end solutions for a range of voice communications and data networking solutions including IP telephone systems, data networking, video, wireless and cabling. We have provided solutions to over 1,000 small-to-medium businesses in the New York Metro area. With achievement in exceeding the “World-Class” Customer Experience threshold in customer loyalty from ShoreTel we deliver effective, understandable solutions that help you work faster and easier, on time and within budget.